Our after-school programs have two main beneficiaries – the learners themselves and the tremendous young people who staff our programs – our “coaches”. These coaches are university students and most are training to be maths teachers. 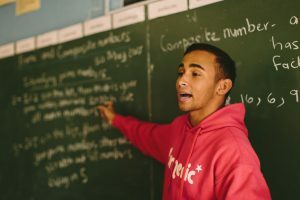 Throughout their year as a Numeric Coach, these pre-service teachers gain an additional 240 hours of practical training – in maths content, pedagogy, classroom management, formal teaching observations, personal mentorship, and in-class teaching time. If you are interested in becoming a coach, please check back with us in September as our recruitment season for the following school year starts in September.